We're so excited for her! Heart Evanglista is pregnant with her first child! She made the announcement on her Instagram account on May 12, 2018. In an exclusive interview with Aa Patawaran of Manila Bulletin, Heart shares how she is "super terrified and scared but excited at the same time." Manila Bulletin also shared on their Facebook page the video of the exclusive interview, where Heart expresses her thoughts and feelings about this important moment in her life. She says that she and husband Senator Francis "Chiz" Escudero waited three months to get pregnant. Senator Escudero already has two children with his former spouse. Heart recalls, "I still consider myself very lucky because we tried for three months [before] I got pregnant. And so I was really shocked that, 'Oh my god, I got pregnant.' And that was the time that I was working out a lot, and you know, so I didn’t really think that I was going to get pregnant." The power woman is also ready to do a lot of the pregnancy routines by herself, and Senator Escudero is more supportive now. She says, "I never really thought that I would, you know, have him with me all the time. I'm pretty independent in terms of doing things; I just like to do things on my own. But [Chiz] was very, very supportive. And even [with] just getting my blood test, he also took a blood test because I hate needles. He didn't really need to get a blood test, but he still took a blood test so I didn’t feel alone." She laughingly admits, "He was sweet before; he’s even sweeter now. I must say, I’m really enjoying the perks of being pregnant." Heart mentions in the video interview that she wanted to keep the baby a secret for a while, but it got more difficult to keep it from the public: "I also needed to ask advice because, you know, there are certain things that I’m supposed to do that I can’t do. So how do I tell people that I can’t go to this thing, that I can’t join the marathon, or whatever. So I had to tell them." Heart says that they still do not know the gender of the baby, but the baby room has already been designed in neutral colors—"very classic." 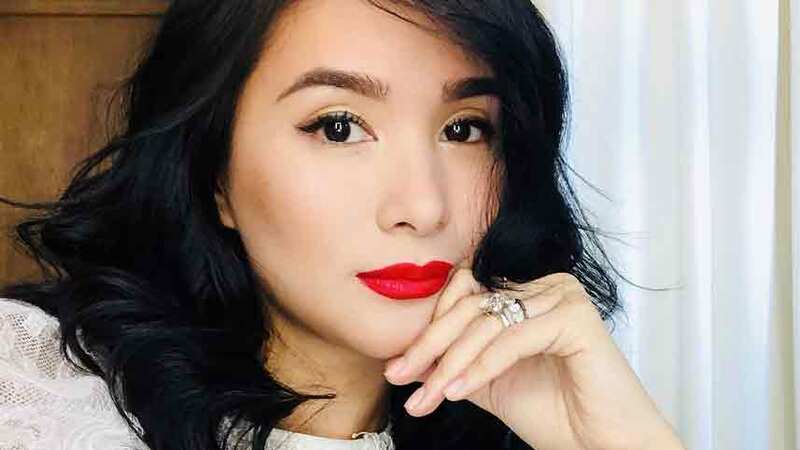 The Kapuso actress and artist also shares her thoughts on her future self: "I feel that I’m going to be a modern, modern mom. I'm not going to forget about my dreams. I’m going to dream with my baby. I’m going to teach her how it’s done." She also reveals that she may have to take a break from painting for a while: "When you’re pregnant, there are certain things that you don’t feel like doing, and I don’t feel like painting. So I’m kind of having a problem, because it’s just gone. I just want to sleep all day, every day, and watch TV." The glowing mom-to-be is now focused on taking care of her baby and their future: "I’ve lived a full time, so I feel like I have so much, like I have so many stories to share and experiences. I’m excited. I’m excited for my child. It’s going to be a fun life."